Here’s an old favorite, good any season of the year. And for those pesky bananas that zip right past their 30 second window of ripeness, it’s a great way to use produce and have a taste of comfort food. This is delicious with a cup of morning coffee or afternoon tea. Preheat the oven to 325 degrees F. Grease and flour two 9×5 inch loaf pans. (Or just spray with Pam baking spray). Or, use a muffin pan if you prefer muffins rather than a loaf of bread. Spray muffin cups with Pam, or use cup cake paper liners. Sift the flour, salt and baking soda into a large bowl. In a separate bowl, mix together the butter and sugar until smooth. Stir in the bananas, eggs, vanilla and nuts until well blended. Pour the wet ingredients into the dry mixture, and stir just until blended. Divide the batter evenly between the two loaf pans, or muffin cups. Bake for 50 to 60 minutes in the preheated oven; about 20 minutes for muffins if you choose that option, or until a knife inserted into the crown of the loaf or muffin comes out clean. Let the bread cool in the pans for at least 5 minutes, then turn out onto a cooling rack, and cool completely. Wrap in aluminum foil to keep in the moisture. 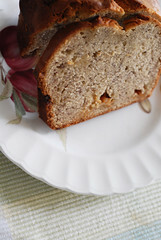 Two other tips for free…if you have bananas that are getting too ripe and you don’t have time to make this bread right away, you can freeze the bananas and defrost to use when you’re ready. Throw the bananas into the freezer unpeeled and whole (the skins will turn black when the fruit freezes, but it doesn’t affect the taste). Or, if you have time to prep, you can peel and slice the bananas and freeze using a freezer bag. Use in the bread recipe or use a few slices at a time in fruit smoothies or milk shakes. When you thaw the bananas to use in the bread recipe, the texture will be almost liquid in consistency, but the thawed fruit works perfectly in the bread. To use the slices in smoothies, don’t thaw, just add to the blender with other smoothie ingredients.